Mangrove Steelband are one of the longest standing steelbands in Europe. More than just a musical entity, Mangrove Steelband is steeped in a rich and significant social and political history. ‘The Mangrove’ name derived itself from a Caribbean Restaurant and community association based on All Saints Road, both of which became national symbols of resistance to police oppression and racial injustice following ‘The Mangrove 9’. The Mangrove Entities attracted grassroots activists, the dis-enfranchised Caribbean migrants, left-wing radicals and talented individuals, eager to have a platform to create and exhibit the traditional carnival arts of steel pan and mas. This created a truly inclusive policy, with the band consistently attracting established players and those new to the instrument of all ages, ethnic and socio- economic backgrounds. This core principle is as relevant today as it was initially, with both the core ‘stageside’ band and the larger ‘panorama’ band consisting of diverse members. The band established itself in 1980, on the famed All Saints Road, Notting Hill, by Trinidadian migrants determined to have an outlet for their cultural heritage, which was actively suppressed by the racism and lack of opportunity indicative of the time. It signified the celebration of Caribbean culture and community cohesion, at a time when racial tension in the country was almost palatable. This special history is an ethos which still resonates with the band today in it’s endeavors. The band play with pride, understanding they are both advocates for the steel pan instruments and Caribbean culture, and also members of an entity, which has a stake in the local community. Mangrove Steelband have been recognized for their artistic excellence by being booked for tours all over the world including Tanzania, Malawi, Romania, Holland, Spain, Mauritius, Sri Lanka, Trinidad, Slovakia, Israel/Palestine, Dubai, Poland, Bulgaria. We have also played at prestigious venues such as The Royal Festival Hall, The Royal Albert Hall and Buckingham Palace promoting the band and the instrument to new and existing audiences. 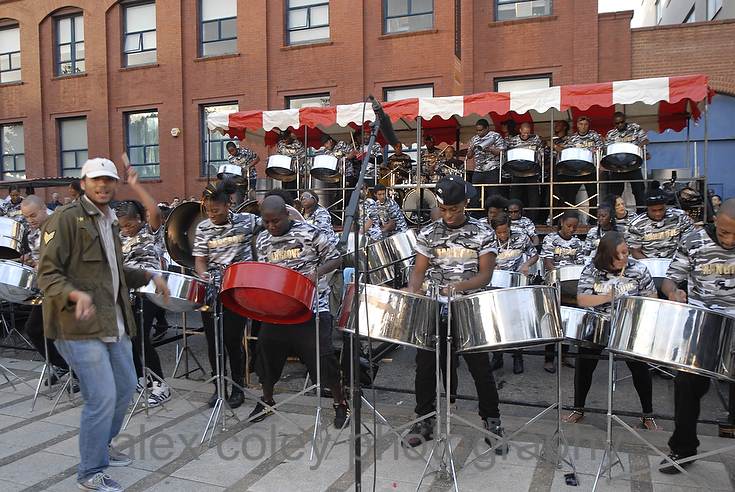 The highest accolade for the musical capabilities of a Steel band is the annual Panorama competition, taking place the day before Carnival Sunday. This sees the band swell up to 75 members, who give up their summer to rehearse and perform an original 10 minute composition. The experience takes those of varying abilities and learning styles and puts them into a large orchestra, their teamwork, active listening and of course musical skills. This piece is then judged alongside several other bands and a winner is crowned. Mangrove have won this prestigious competition an impressive eight times.